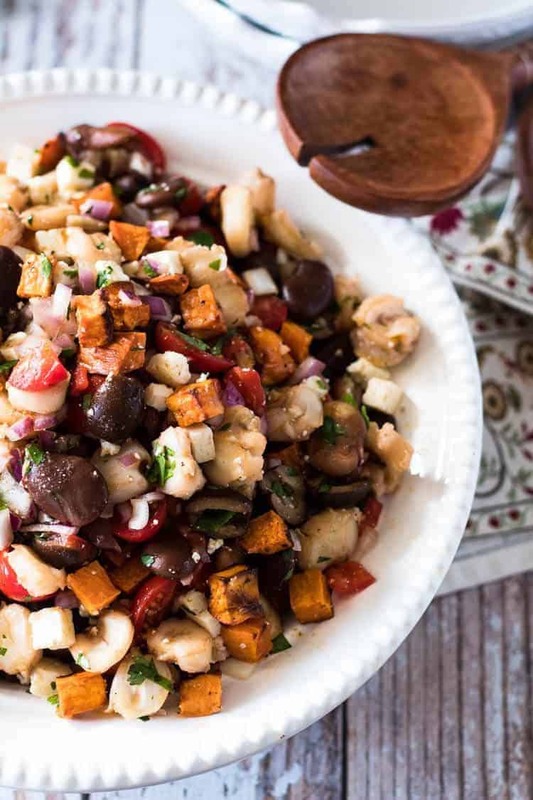 This versatile Roasted Sweet Potato and Giant Corn Peruvian Salad takes its cues from Solterito, a beautiful chilled salad from Arequipa, Peru. 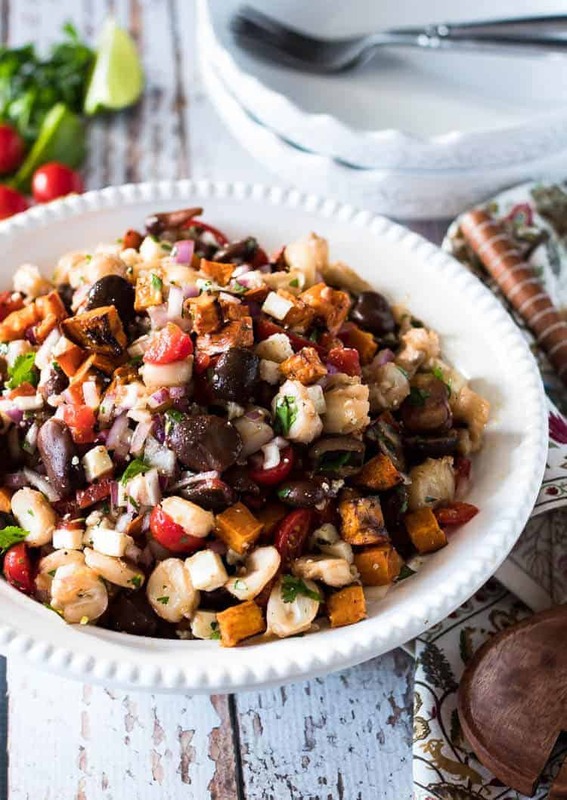 Giant corn (choclo), fava or lima beans, salty queso fresco, hot rocoto chiles, roasted sweet potato, black olives, red onion, and fresh tomatoes get tossed with a simple lime and cilantro dressing… Delicioso! Something I learned when I was very young: with cooking, it doesn’t matter where you are; you can always cook. You can end up in a small village in Peru where somebody’s cooking, take a spoon and taste it, and you might not be too sure what you’re eating, but you can taste the soul in the food. That’s what is beautiful with food. Ah, the food of Peru! My love of Peruvian food came in middle age, when my brother married a lovely Peruvian woman who just happens to be an amazing cook. Prior to Josselin’s joining our family, I knew nothing of the cuisine. Fast forward about 15 years, and our move to south Texas, and we began hanging out with an art history professor who studies Peru, and his Peruvian wife. It has only been in the last couple of years that I began to “play” with Peruvian flavors. My experience with the food and flavors of Peru is about to become real, as we look forward to the entire month of June in Cusco, Pisaq, Ollantaytambo, Machu Picchu… The climax of this trip will be the 5 day/4 night Ausangate trek, with several passes above 14,000 feet elevation. I know that we will have 1 or 2 opportunities to try cuy (guinea pig), along with other classic Peruvian dishes. Exciting, yes? I’d best get back on topic. 😀 What is solterito? The word “soltero” means “single,” and “solterito” loosely translates to “little single man.” Some say that this traditional dish from the Arequipa region is named for singles that are dieting in order to attract a partner. Lol. Seriously, though, this dish is full of nutrients and loaded with fiber, and relatively light compared to many Peruvian dishes. It is a chilled salad, and there are as many “recipes” as there are cooks that make it. Today I bring you my version (one that has the approval of our friends) that is based on Peruvian flavors and made with ingredients that are pretty widely available. When pursuing an idea for a Peruvian-inspired dish, I frequently look to Peru Delights. I knew I wanted a salad with giant corn that included fresh veggies. I came across this recipe for Solterito. I made it my own, but I will always credit my inspiration. I could not find fresh fava beans, but opted to include dried. They cook in about the same time as the giant corn, and my pressure cooker sped up that process. Sweet potatoes are an important ingredient in Peruvian cooking, and I have included roasted sweet potatoes in my version. I also opted to dress my Peruvian salad with lime juice and cilantro. This is a versatile recipe, so feel free to change it up to suit your tastes and availability of ingredients. Choclo (aka Peruvian corn or Cuzco corn) is a very large kernel field corn from the Andes. It is not a sweet corn. In Peru, choclo is served as an accompaniment with dishes like ceviche. Full ears of corn are a popular street food in Peru. 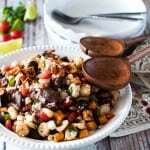 I use Goya Giant White Corn in this salad. If you can’t find it, you can substitute hominy (prefereably dried and reconstituted), but keep in mind the flavor and texture will be good but different. I get excellent results cooking the giant corn with the dried fava beans in my pressure cooker on the “beans/legumes” medium setting and doing a natural release. That process does not require soaking, and is done in about an hour. If you cook on the stove, follow the package instructions. The corn and beans must be cooked prior to making the salad. While the corn and beans cook, I prep and roast the sweet potato. The rocoto peppers are hot, and not always easy to find. You can substitute Spanish piquillo peppers, or roasted red bell peppers. I specify queso fresco (a semi soft fresh cheese) cubed. Any mild, fresh white cheese (i.e. mozzarella) will work. We have turned this tasty salad into a main dish by adding Gulf shrimp marinated in aji amarillo chile paste and lime juice, skewered, and grilled. Pair with a citrusy IPA or crisp sauvignon blanc… Fabuloso! 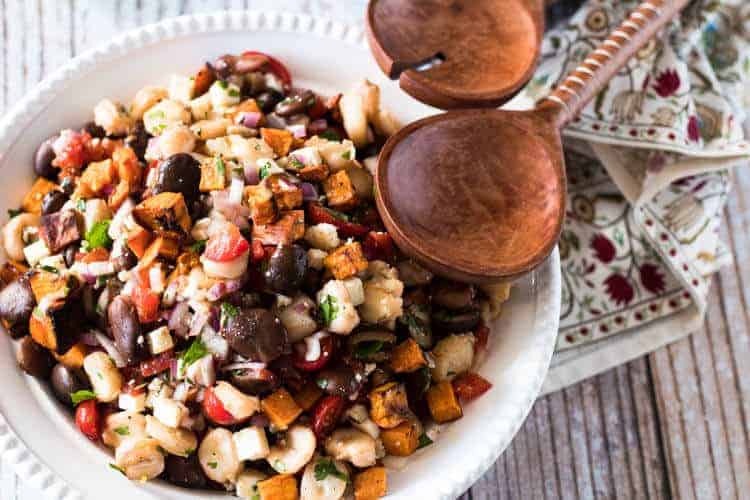 This versatile Roasted Sweet Potato and Giant Corn Peruvian Salad takes its cues from Solterito, a beautiful chilled salad from Arequipa, Peru. 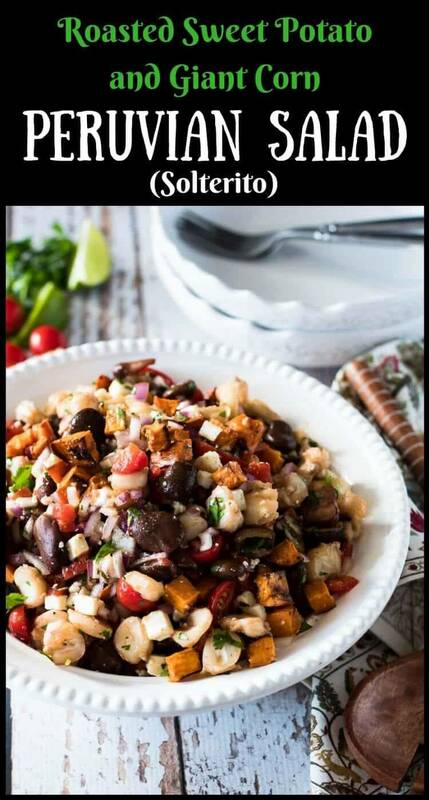 Giant corn (choclo), fava or lima beans, salty queso fresco, hot rocoto chiles, roasted sweet potato, black olives, red onion, and fresh tomatoes get tossed with a simple lime and cilantro dressing... Delicioso! Prepare giant corn and fava beans. I use my pressure cooker beans/legumes setting on "medium" (30 minutes), and allow it to de-pressurize naturally. This process takes about 60 minutes total. Preheat oven to 425 degrees (400 convection roast). Toss the cubed sweet potato with a drizzle of olive oil. Season with salt and pepper. Roast until tender and browned on the edges - about 25 minutes. Whisk the salad dressing ingredients together, and set aside. When the corn, beans, and sweet potato are cooked and cooled, add to an appropriately sized salad bowl. Add the tomatoes, onion, peppers, olives, and cheese. Toss with the dressing. Check for seasoning. Garnish with chopped cilantro. Enjoy! I don't have any trouble finding giant corn locally. If you can't find them, hominy is a decent substitute. Start with dried or frozen. The canned product will be too soft. Lima beans (fresh or dried) would be a great substitute for the fava beans. Just make sure to start with tender (not soft) cooked beans. Rocoto peppers are hot! They are so flavorful, but proceed cautiously. Start by dicing one - or even half of one. You can add more if desired. As I mentioned, we have taken this dish as a side dish to a party, but we have also enjoyed it as a main dish with the addition of grilled shrimp. Grilled chicken would be a great option as well. Macronutrients (approximation from MyFitnessPal): 269 calories; 11 g protein; 15 g carbohydrates; 19 g fat. Found it! I am for sure going to try your version, which is radically different than mine. I was able to get dried fava/broad beans, but have not yet found the dried chocla corn. Rubens maybe? Any suggesions for local sources? Love the inclusion of sweet potatoes. This sounds really good. Thanks for letting me know you'd posted this recipe. OMG, I am so jealous - an entire month? How absolutely lovely. We went about 2 years ago now and loved Cuzco, Sacred Valley, Machu Pichu, and Lima. The food in Lima was arguably some of the best. Email me if you want a few tips on some restaurants. Anyhow, I am in love with your food selections. Interesting and worldly. Well done. Thanks Cindy! I am a fan of interesting and worldly :-) I think my unusual recipes have been a bit of a handicap, but I have to cook and write what I love! I would love some recommendation on restaurants. We will only have 1 or 2 nights in Lima, with the rest of the time spent in smaller cities. My husband is teaching a 3 week course on alpine ecosystems of the Andes. I will try to remember to email! This sounds delicious with so much goodness and flavors happening! Bookmarking this!